Various topics that I wanted to make noise about. Some are vitally important, some are a bit of fluff. Atheism, Christianity, Conservatism, Leftists, God, the Bible, the lie of evolution, scams, spam, software, whatever. בְּרֵאשִׁית, בָּרָא אֱלֹהִים, אֵת הַשָּׁמַיִם, וְאֵת הָאָרֶץ. There are two videos at the end of this article that I urge you to watch. For years, secularists have been actively protecting evolution from serious scrutiny; people are not educated in thinking logically and examining the evidence. (This can be seen and heard from many modern atheists who claim to use "reason", but are unable to do so.) Instead, they are told what to think and not how to think. Evolution is a cornerstone of atheism and other secularist religions. Biblical creationists not only show the flaws in evolution, but also stand on the authority of God's Word instead of making idols out of scientists. In fact, many secularists have elevated science itself to a kind of deity status. I made this in May 2010, and I'm pleased to see that it has been around. Sometimes, with variations. Ridicule. Discrimination and persecution often begin here. It can be the "appeal to ridicule" fallacy ("Do you realize what people will think if they found out that you believe in God? "), or outright mockery. Notice how this is extensive on social media, and Facebook is known for shutting down Christians and political Conservatives. Confusion. Attacking people with a barrage of statements, leading questions and outright nonsense, then affirming that atheism uses "reason". Marginalization. Using misrepresentation and straw men (which can be seen in the appeal to ridicule fallacy mentioned above), selective citing or simply brushing someone off as unimportant because of their worldview (often using the "genetic fallacy" and "poisoning the well"). This is different from brushing something or someone off because you have concluded that they are wasting your time, however. Trolling. Atheopaths will go on a jihad to attack Christians and creationists all over the Web instead of allowing freedom of speech and freedom of expression. Silence through intimidation. Intimidation, bullying and stalking. The aforementioned trolls use ridicule and confusion to attempt to intimidate people (but they become furious when people stand up to them and show their fallacies), and some resort to stalking. Nit-picking. Militant atheists and fundamentalist evolutionists will pick on an article's introduction and ignore the substance. Similarly, they will find something that is not documented and complain about that (again, ignoring the main part of an article). Labeling. People will use loaded terminology (including nonsensical and dishonest words like "homophobe" and "anti-science"). People like Richard Dawkins and his followers will call "religion" a "virus", and people who teach the Bible to their children are "child abusers". "Religion is dangerous" is a fallacious generalization. Since so many people lack critical thinking skills, they simply accept the emotive terminology they receive rather than risk being politically incorrect by challenging it. Concentration and repetition. This is a propaganda technique where if something is repeated enough, people will eventually believe it (whether it is true or not). Legislation and activism. Militant atheists are attempting to remove the rights of Christians, as is seen in the news on a frequent basis. Teaching creation science is becoming illegal in Britain. Opposition. Atheo-fascists attack Bible-believing Christians on issues of abortion, homosexual "marriage" and others. Ironically, they act like it is some kind of moral imperative to oppose us on those issues as well as evolution, yet they do not have a consistent moral standard! Note that there are very few who hold to politically conservative viewpoints. Global warming (or "climate change). They are in agreement with the environmental extremists regarding anthropomorphic global warming. Those of us who disagree with this, as well as with evolutionism, are "science deniers". Violence. 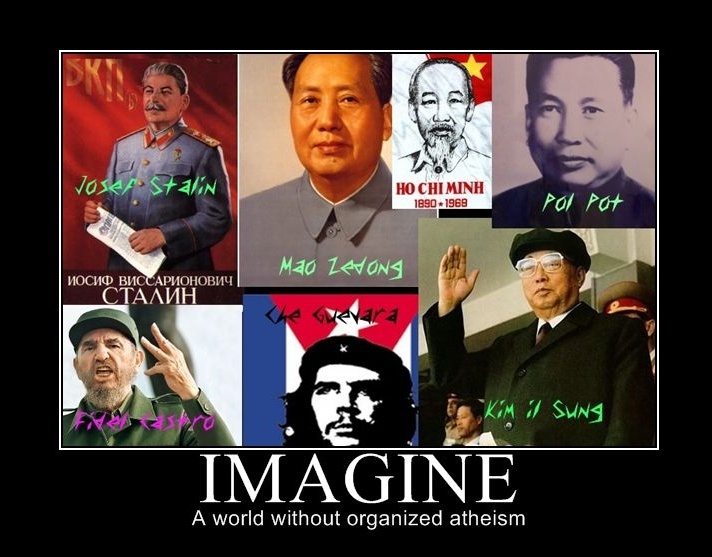 We know what happens when atheists get political power. On a less obvious level, vandalism of Christian places is increasing, and yes, violence by atheists is also increasing. Note that most atheists deny this, saying that atheism had nothing to do with killing. It is another expression of hatred for God and his followers. Militant atheopaths are ridiculing, marginalizing at finding various ways to attack Christians. We need to be aware of the threat and arm ourselves with our own activism, prayer, knowledge of Scripture, true science and more. We need to use our rights to speak out and resist them instead of rolling over and letting it happen. If we don't use our rights, we may very well lose them.